Hi everyone, I was really excited when Marina from Inkspirational asked me to be a guest designer for this colour challenge. I seem to use purple a lot so I definitely think it's one of my favourite colours! For more information pop over to Inkspirational, the design team have some wonderful projects to inspire you. I bought this verse stamp recently from Jemac Stamps and this is the first time I've inked it up. I recall having this prayer and the Desiderata hanging up at home when I was growing up, so finding the stamp brought back lots of fond memories. I tried the Belleek inspired technique for the background. There are so many beautiful examples by card makers and I'm not sure where I first saw it. I brayered the label side of the embossing folder with bundled sage distress ink, so the embossed card came out with the raised white design highlighted. I love the effect, just need to practice a lot more! The greenery is cut from snippets of green card with Memory Box Madeira die. I've trimmed pieces off to fit into the corner. The flower is one of the Stampin Up Flower Shop stamps, coloured with Inktense pencils and shaped. I layered 2 together for dimension. I'm linking up to a couple of challenges. Pixie's Crafty Workshop where you just need to use a snippet on your card to join in. At Cuttlebug Mania the theme is Let's Feel It, to add texture. You also need to use a manual machine like a Big Shot for your project. Materials used: Rebecca embossing folder; Jemac Stamps verse; Stampin Up Flower Shop; Inktense pencils; distress ink; Mpress label die; Memory Box Madeira Corner die. This is absolutely gorgeous! 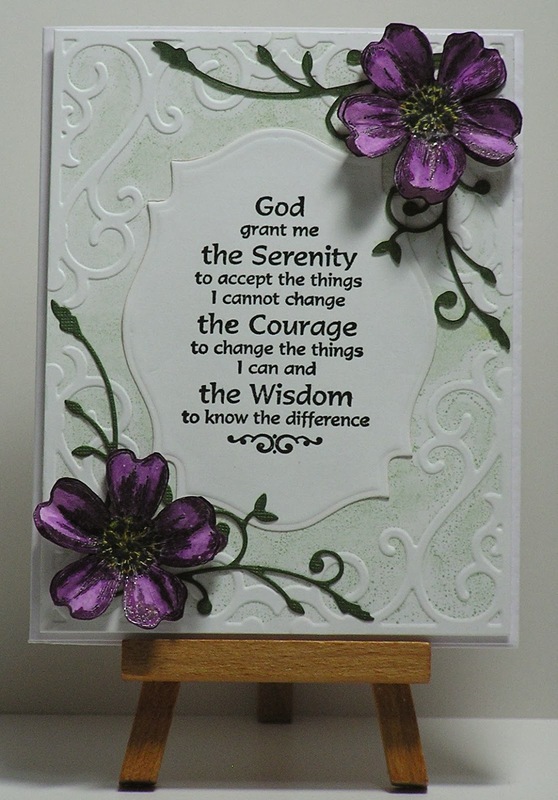 The design of the card reflects the 'serenity' of the verse.The flowers are perfect - what a beautiful shade and really worth zooming in on for the detail. This is so pretty. Love this Belleek effect you have created.! Absolutely beautiful card Cathy. Love the background, it's a fun technique, and the verse and flowers are perfect. Beautiful card, love the embossed background. This is beautiful Cathy. Those flowers are stunning, love the background and the beautiful framed sentiment. So glad you are our Guest Designer for this challenge at Inkspirational. Gorgeous card, Cathy - I dropped by Inkspirational and saw your picture there - nice to see how you look like! Your card is beautiful, Cathy,so elegant and the purple flowers are stunning. Thanks for guest designing for us at Inkspirational! I've tried the Belleek technique and it's really hard to get the color even! Your's is beautifully done and so pretty with the purple flowers and wonderful prayer! This is beautiful Cathy! The background looks fabulous and I love the coloring on those flowers. It looks like this color combo was perfect for you. =) It is great to have you designing with us at Inkspirational!